A few milestones in life warrants the need for a printed greeting card and a person’s septuagenarian or 70th birthday is one of those. If anyone in your life is celebrating this special event soon, why not surprise him or her with a specially designed golden birthday card? In this write-up, we will provide you with different examples of septuagenarian birthday invitation card templates that you can download and use. Also, we will share useful information on how you can create and personalize these templates into something that the recipient will truly love and cherish. As promised, embedded below are various examples of 70th birthday invitation card templates that anyone can use as a greeting and invitation card for their 70th natal day celebrations. Take a look! What is a 70th Birthday Card? 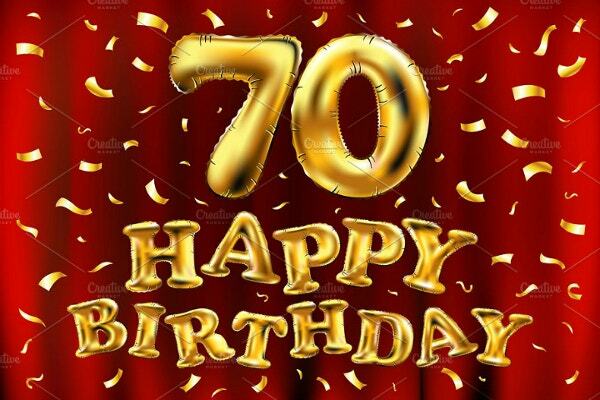 As we have mentioned earlier, a 70th birthday card is a greeting card given to a person who is celebrating his or her 70th birth or natal day. It is called a septuagenarian birthday since 70 years is synonymous with and is sometimes referred as the septuagenarian age. There are many things that can make a regular birthday greeting card into a special 70th birthday card. One of which is the explicit use of septuagenarian birthday greetings or wordings on the card cover face itself. Other less subtle design elements that may signify a septuagenarian birthday are diamonds, trees, dad/mom jokes, and even retro pictures, font styles, or themed background patterns. Just like creating and choosing any greeting card design, it will all be up to the sender of the card on what kind of septuagenarian birthday card design he or she wants to send. There is no hard and fast rule when it comes to choosing a septuagenarian birthday card design. A safe bet would be to follow your personal preferences while still factoring in the recipient’s personal taste. The best birthday card is one that successfully encapsulates both the sender and the recipient’s sentiments for themselves and for each other. Septuagenarian birthdays should be celebrated. After all, not many people ever reach this age due to the prevalence of adult diseases, natural disasters, and other life-shortening factors. So if you want to make sure that you create an original birthday card design that your 70-year-old relative, friend or spouse will appreciate, try to apply the different design techniques that we are listing below. You may also see invitation cards in psd. The use of pop-up cards can be an awesome birthday card design technique if you wish to add both levity and creativity in a greeting card. A pop-up in a greeting card also gives its recipients a pleasant surprise since the pop-up literally appears out of nowhere. The more intuitive your pop-up designs are, the better the card recipient’s reaction will be. And to make sure that the pop-up birthday card is memorable, do not forget to a witty message or joke. The gift of laughter is often one of the best birthday gifts one can give and receive. Check out this article for more information on how to create a greeting card. If the recipient of your 70th birthday card or the person celebrating his or her 70th birthday party loves scrapbooking, he or she would love to use scrapbook embellishments on his or her birthday invitation card. These embellishments may include but are not limited to beads, brads, buttons, enamel pins, flowerettes, birthday stickers, and cut-outs. When you add embellishments to a regular birthday card, you help give the card a new look. Card embellishments can also be used to help enhance the appearance and to emphasize the effect you want on the card recipients. You can browse for and look at diferent scrapbook album design templates in the linked article. Another way to make sure that your 70th birthday invitation card stands out is by incorporating different kinds of paper folding techniques. You do not have to rely on the regular folded birthday card format. Instead, you can add and use different folded structures on your card design or you can even use an origami figure as your birthday card itself. For example, you may create an accordion fold birthday card. And if you want to go all out, you can create a birthday card that resembles a crane or any origami object you want. The beauty of origami birthday invitation cards is that they are seldom used as greeting or invitation card designs. This means that you will a truly original card design for your birthday if you wish to glam up your current birthday card or invitation card using this design technique. You may also like corporate invitation cards. Kirigami is another Japanese art form that literally translates to paper cutting. In the modern age, you can buy pre-made paper cutouts and just stick them into your birthday cards. But if you want to create a handmade birthday invitation card, you may draw, trace, and cut-out your kirigami designs yourself. Another time-saving approach is the use of digital craft cutting machines like Silhouette, Cricut, Sizzix, Brother ScanNCut, and others. These electric paper cutting machines allow you to create a digital file of the paper pattern that you wish to cut out and the machine will do the actual cutting for you. Some of these machines may also feature a scanner and may also cut other things like fabric. Birthday invitation cards that incorporate some kirigami or paper cutting embellishments tend to appear more creative and elegant. Use this design technique if you are planning a formal dinner event or a birthday bash for your 70th birthday celebration. One easy way to glam up any birthday card or invitation card is to use a specialty paper, card board, or cardstocks for printing out your birthday card templates. You may choose patterned papers or those with embossed logo designs and illustrations. Choose a paper style that will also match your birthday card theme so that the final card will look very put together. Specialty paper can also help create a dramatic effect on the birthday card. This is helpful for those want their birthday invitation cards to look formal and elegant. On the other hand, there also are specialty papers that can make your birthday card invitations appear more playful and fun. And if you want this effect from your birthday invitation cards, it is best to choose a paper design with a fun and bold color. 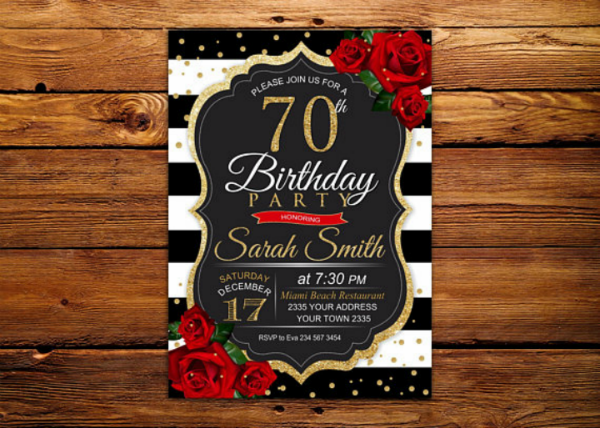 It is not always necessary to do any additional crafting or designing of your printed 70th birthday invitation cards since most of these printed cards can truly stand on their own in terms of design and layout. However, if you just want that additional oomph from your birthday cards, following any of the different design techniques mentioned above is the way to go. As a bonus tip, you may also combine any of these different design techniques and create a truly original 70th birthday card invitation design. Check out this article for more tips and information on how to design your own party invitation card. If you are on a budget, using pre-made printable birthday card templates is a cost-effective alternative. This is especially important for those who are going to create multiple birthday cards. This is a common practice for institutions and businesses who send 70th birthday getting cards to their members or employees. Individuals who wish to create golden birthday cards will only need to use and create one birthday card so this factor may not apply to them as much. But in terms of cost, individuals can still save money by using pre-made card templates since they only cost a fraction of the cost of creating or buying a regular birthday greeting card. Another positive aspect of using pre-made 70th birthday invitation card templates is that they offer its end-user enough creative freedom in personalizing a pre-existing birthday card template. This is an important aspect in card-making that most people should consider especially if they want their sincerity to shine through the act of card-giving. For more information on making your own greeting card, check out this article on the ultimate card-making guide. Also, note that a golden birthday card will be considered creative not only by its template design but also through the different post-printing design techniques that you apply to the printed card. For example, you may add embellishments and paper cut adornments on the birthday card to make it look more three-dimensional. By doing this, you also help boost the sentimental value of the 70th birthday card. A pre-made birthday invitation card template is a digital file and it will live forever on your hard drive or any storage device unless you delete it or the device gets corrupted. This feature also allows you to reuse the birthday card template for any suitable occasion and not just for 70th birthday celebrations. There is nothing wrong with using the same birthday card template designs as long as you write an original and personalized message on the card. This will make the card recipient feel more appreciated and realize that their friends and family members have not forgotten their special day. When you have a reusable birthday greeting card template, you also retain all the creative power in customizing the template according to your preferences and the card recipient’s preferences. In addition, you are saving more money since you will no longer need to buy handmade birthday cards or another pre-made 70th birthday card template. 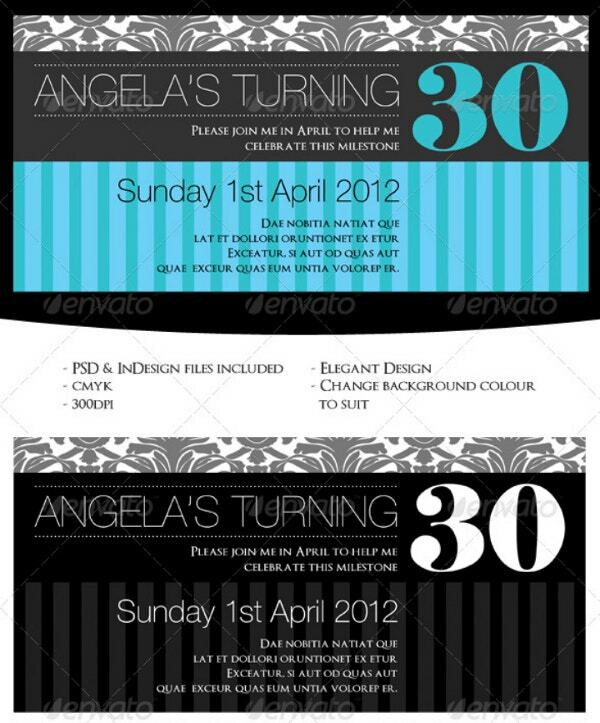 There are many types of pre-made printable birthday invitation card templates available online. Most of these card templates are well-designed and will fit as card design choices for those who are celebrating their 70th birthdays. And despite having each birthday invitation card template available for almost anyone to download and use, the end-user of each card template can still do so much with it. Remember that when purchasing any pre-made card template, you have all the power to customize the template and transform it into an original looking birthday card. Do not worry about someone else having the same copy of your chosen 70th birthday card design. Instead, you should focus on how you can make this one invitation card template into something memorable for its recipient. Another advantage of using printable birthday invitation card templates is that they often come in pre-formatted printing formats. For example, if you are looking for a 70th birthday flyer template, you will most likely want to choose a template that is available in flyer printing format (usually A4 or letter size). On the other hand, if you want to give a brochure-like birthday invitation card, you would want to choose a birthday invitation template that is available in brochure or booklet printing format. Most printable invitation templates sold on online graphic design marketplaces will already include this piece of information. So be sure to read the template’s descriptions prior to purchasing them. When you know what specific printing format to use, it will be easier to choose from a multitude of golden birthday invitation card templates. Flexible customization options are one of the biggest draws for using pre-made birthday card templates. After all, most people want to make sure that the golden birthday greeting cards they give out are sporting the best cover designs and inner flap messages. When you use a printable template for creating a golden birthday card, you will have all the ability to edit the text, images, and other design elements included in the template. Therefore, you should choose a birthday invitation card template that will allow you to make all your desired template changes. Photoshop, InDesign, and Illustrator templates often have the most flexible editing options out of all graphic design template file types. Take note of all of these advantages and tips so that you will make a more informed decision when it is time for you to choose a 70th birthday card invitation template. Also, remember to use this list of advantages only as a guideline. Do not limit yourself with everything on this list when it comes to choosing a 70th birthday card template design. Follow your instincts and choose the birthday card template design that you like best even if it does not include all the typical functionalities. You may also check out unique business card designs. Despite risking sounding too preachy, the best 70th birthday card is the one that was created with the best intentions and thoughts towards the card recipient. Remember that the person you are giving the card to is celebrating his or her seventieth birthday. This person may be your parent, grandparent, aunt, uncle, teacher, neighbor, colleague, spouse, sibling, cousin, or friend. Give them all the respect and love on this special day by making sure that they get the best 70th birthday invitation card you could create. You may also see anniversary greeting cards. If you wish to spread the love for those spending their septuagenarian birthdays soon, post this article on social media and share this article with your friends and colleagues so that they, too, can create the best golden birthday cards for their loved ones.